A red wine of fine quality with a very strong body (and an a high alcohol content above 14 %) accompanied by a very characteristic aroma. 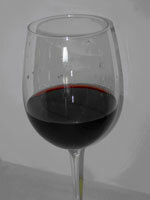 It is often considered a "cousin" of the Californian Zinfandel for its tasting similarity. This wine can be dry but it can also be found in a sweet variety. It is usually suited to moderate aging (8-10 years). 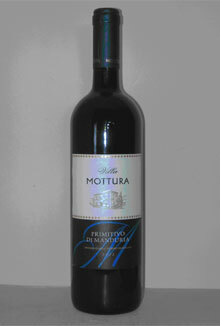 The origin of its name, Primitivo, comes from the type of grapes from which this wine is principally made that has the tendency to ripen earlier than other types of vines. According to the history (or legend? ), the name was chosen by a priest - Don Francesco Filippo Indelicati - who noticed that, among his grapes, there was this one ready for the ripening already by the end of august. He called it "Primitivo" that literally means "the first, the earlier..". The red dry variety is excellent with meat, particularly pork, and with spicy food. The sweet liquorous one is a good company with all the desserts. It is a very ancient wine probably being developed by a colony of the Messapians who settled in the coastal zone of the Salento - along the Ionian Sea - one or two centuries before Christ. Today it grows in the area between Taranto, Brindisi and Lecce in the Apulia region. The world's most complete guide to quality Italian wines, published by Gambero Rosso and Slow Food Editore. Over 16,000 wines are reviewed, selected by a team of more than 120 tasters under the direction of GR and SFE. 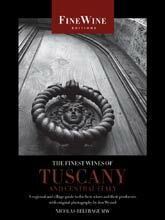 Also includes a useful series of appendixes about award-winning wines in the past and the best producers. The guide also pays special attention to wineries that are sensitive to the environment and to achieving naturalness in their products.